Apologies for those trying to get to NICE documents via TRIP – the majority don’t work. Fortunately (!! ), this isn’t our fault. NICE have moved over to a new CMS and as such the bulk of the old URLs are defunct. Initially, the changes were introduced with no re-direct. However, they appear to have introduced a minor fix – which doesn’t work on TRIP. Bottom line: I’ve re-indexed the guidelines and technology appraisals and they should be ‘searchable’ over the weekend. So, why the question and so what? We answer a large number of questions (50+) and over the years we’ve answered more than 10,000 (of which 7,000+ are online). However, we answer a small proportion of the total healthcare questions answered. Most of the questions are answered by clinicians themselves. Wouldn’t it be good to create a framework to allow these Q&As to be shared? Also, TRIP is designed to help clinicians (and ourselves) answer clinical questions. So if a clinician answers a question using TRIP, it makes sense to share the fruits with other TRIP users. This post is the first in a ‘Highlight a TRIP feature’, to start with we’ll be giving some information on our new ‘More’ section. Prior to our latest upgrade we included a number of wiki-based content providers including Ganfyd and Ask Dr Wiki. However, the slight problem is that wikis are ‘works in progress’ and frequently the content could be considered not robust enough! However, the problem is that wikis have some great content and we feel they need exposure. At the same time there is an increasing volume of webcasts and podcasts becoming available. Again, valuable content and not searchable from other sources. Currently, the ‘More’ section contains over 6,000 wiki articles and more than 2,500 web and podcasts. When doing a search you can easily view the ‘More’ content by clicking on the link – see below. Experience from the first week! Wow, only just caught my breath after an intense, post-launch week. Miraculously, no major hitches. The algorithm has been behaving itself, although I got an anxious e-mail telling me a load of evidence has gone missing. This was due to a new feature we’d introduced that allows the system to remove results if the text score is too low. In other words if the search terms are barely mentioned in the document it’ll score low. It appears that I set it too high, so I’ve removed that for now. Our specialist search sites have continued to grow and we’ve had feedback from a few publications who we’ve included. Below is an updated usage chart, the blue bars represent usage, from launch, to Friday 16th while the red bars are usage to today. We’re aware of a few usabilty issues so we’re working on those. As a heavy user of TRIP I still find the moving around of the results categories confusing. Where Q&A used to be is now EB synopses, so that’ll take some getting used to. One final thing, we added a load of webcasts and podcasts at launch and the most popular is the NEJM video on Pelvic Examination which has been viewed 27 times. The new TRIP has been live for nearly 3 days now and thankfully there have been no significant problems. We’ve had a steady stream of comments (all positive) and the occasional issue relating to usability. All of these have been highly sensible and we’ll act on these shortly. I like looking at the site stats, so with 26 new specialist sites I’ve got lots more stats! The new sites have been searched thousands of time and we’re starting to see some trends. Find below the most popular ten sites. I’ve graphed the results so you can see the variability. After a few delays the new version of TRIP is out! Much improved search algorithm, more relevant results at the top and less ‘noise’. 26 specialist search engines. 26 today and more in the near future. These specialist search engines allow users to simultaneously search the core TRIP content plus the top 10-15 journals specific to that area. I see it as a bridge between users having to go from TRIP to the full, difficult to use Medline. New content, we’ve added a load of web 2.0 content, wikis, podcasts and webcasts. A trial of linking to UK-approved education. Today the UK but if the trial works we’ll introduce education from around the world. A new category ‘More’ to house the new content. Ability to arrange results by relevance or by year. We’ve removed the big google ads banner. There’s more, but those are the main improvements. Tomorrow, a meeting with our web-people to plan the next upgrade…. The new TRIP won’t go live today, but should do Monday next week. This is principally due to styling issues, but also a small bit of content has gone missing and some content stubbornly refuses to move from eTextbooks to the new, ‘More’, section! We tend to get 25% feedback on our Q&A services. I was surprised how quickly the question was answered, and that I was asked for clarification. The question was related to a group of patients, and it has provided me with further evidence that my ideas and what I am trying to achieve are based on the right lines. Please keep up the good work. I sometimes feel that I search for documented evidence regarding a certain aspect of care, but I probably use the wrong search criteria, so it takes me ages to find relevant articles. Time constraints are such that I would not have carried any search, so having access to such a resource is invaluable. This was an area I had no knowledge of so it has altered my view. The spacing between results is bigger in the pictures than when it goes live, the test version has details of our algorithm, which we’d prefer to keep under our hats. You’ll notice that the google ads, at the top of the results, has gone. The results categories on the right hand side has a prominent ‘Specialist primary research’ link. A slight re-ordering of the results categorisations. 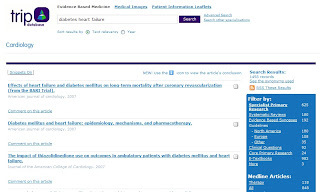 The first search is diabetes heart failure. I hope you’ll notice that the results are all highly pertinent and recent. 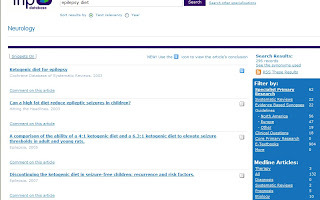 The second search is epilepsy diet. Again really pertinent results, and you’ll also notice a mixture of ‘normal’ TRIP (Cochrane and Hitting the Headlines) with specialist results (Epilepsia). Apologies for cutting the top off the screenshot, I wanted to show extra results. I’ve been involved in clinical search for nearly ten years; without doubt I’ve never been so excited about an enhancement on TRIP. Not only is it technically elegant I genuinely believe this is a massive innovation.